This five-drawer organizer features a chrome frame, file holder and three different size drawers to organize your personal items. 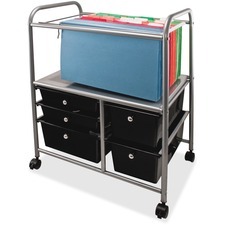 Swivel casters let you effortlessly move your organizer from room to room. Two locking casters prevent the organizer from rolling on uneven surfaces. High-tech metallic rails and knobs create a stylish finish that is perfect for any room. Organizer holds either letter-size or legal-size files.